Fat Tuesday is approaching. As I have discussed before on the these pages, Daniel Lanois’ unique production style leaves it’s unique fingerprints on any project he touches, no matter the genre, no matter the artist. In the case of Yellow Moon that meant fonky R&B courtesy of the Crescent City’s native sons, The Neville Brothers. “Yellow Moon,” the second track on the album, immediately hits with it’s horn laden midnight groove snaking in and out with a straight up funky bassline. See below. Side Note: If you read Bob Dylan’s Chronicles: Vol. I you will recall Dylan spent a large portion of the book detailing the period he spent living in New Orleans in 1988 recording Oh Mercy with Daniel Lanois in an old colonial home in the historic uptown district. Lanois was just coming off the recording of the Neville’s Yellow Moon sessions and some of that n’awlins voodoo works its way into Oh Mercy as well (not to mention Cyril Neville’s session work). 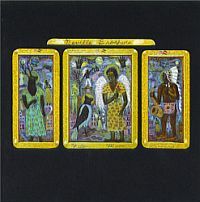 + Neville Brothers available through eMusic’s 25 Free MP3 trial offer. + Visit The Hype Machine for additional Nevilles MP3s.